This week in January, we’re giving you the chance to take on a challenge and take part in the Ride London cycle event. 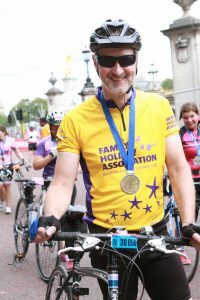 Made famous by the world’s best cyclists at the London 2012 Olympics, this is a truly spectacular event for all involved, so get into gear and apply today! And for this week only, we’re giving you the chance to win a cycle jersey! To enter, simply let us know on Facebook, Twitter or Instagram where your favourite location is to cycle. Terms and Conditions apply, closing date is midnight Sunday 29th January. This cycling event starts in Queen Elizabeth Olympic Park, then follows a 100-mile route on closed roads through the capital and into Surrey’s stunning countryside. With leg-testing climbs and a route made famous by the world’s best cyclists at the London 2012 Olympics, it’s a truly spectacular event for all involved. The finish line is on The Mall in central London.